THE GLUT OF NEWBORNS following the arrival of the Criterion Truck bearing the first official Blut Branson Criterion DVD sends Paul Broth back to the tree he hangs himself from once a year. 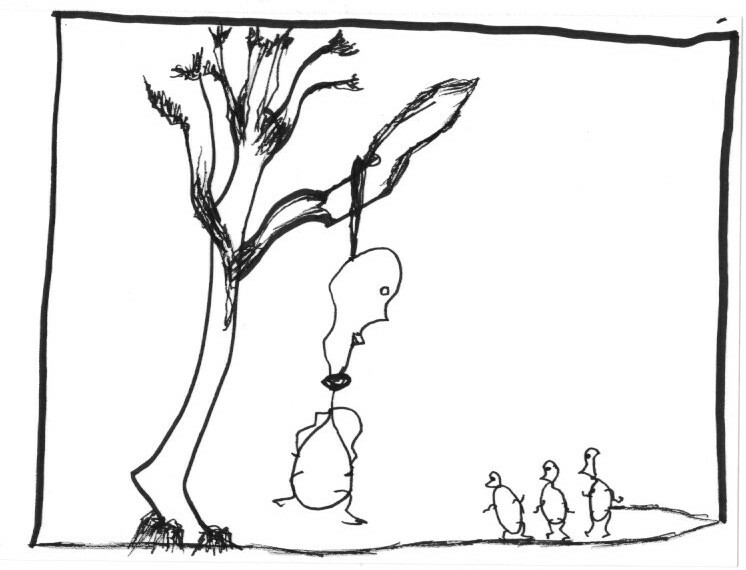 Nothing spooks him more than newborns and nothing calms him more than hanging himself from this tree. The original myth, as I’ve received it, is that Paul Broth founded Dodge City as a community of deserters from some inland war that’s no longer on the books and hung himself when that war caught up with him, remaining in the air for several months until the branch broke and he fell back to earth, into what was by then a semi-functional, if isolated, community. Now he’s known only for the periodicity of his going up into and coming back down from the tree, neither state a permanent antidote to the other. There’s some debate as to whether he dies and returns from the dead each time, or if he’s found a means of hanging by his neck without turning all the way off. Either way, the observable fact is that he takes to the tree and depends from it once a year, coming down a few months later to resume his quiet, private life among the living in town. Over the course of the months he spends hanging, Paul Broth makes a series of pronouncements about life in Dodge City, ever more finely delineating its innermost nature, rewriting our laws, our history, our religion in a stream-of-consciousness which a rotating crew of stenographers is on hand to record, until the branch breaks, returning him to the land of the living and the same blindness as to the true order of things that the rest of us live in year-round. EACH TIME HE HEADS for the tree, which looms above a swamp at the edge of town — the only structure in sight is the Welcome Center, at the far edge — a procession that includes the hangman and a few spectators follows behind. This year, the procession includes three of the newborns who’ve occasioned his flight, crawling through the swamp, growing indistinguishable as the mud covers them, as well as me, Big Pharmakos, and the hangman, who has nothing to do but hold the rope until Broth is ready for it. He wears his hood, though we all know who he is. When we reach the tree, we stand back, reminding ourselves to see Broth’s hanging as a predictable natural phenomenon, no stranger than the reopening of a century plant or the return of an errant bird population after a winter away. He climbs with the rope already around his neck, creeping out onto the branch that has grown in place of the branch that broke after he hung himself from it last time. This is the most precarious moment, as he’s still mortal here, subject to the normal laws of physics: if he falls without the rope to catch him, he could easily break a leg. I can’t watch. I close my eyes and think, If only I could climb that high, maybe I could hang myself with impunity too. I DON’T OPEN MY EYES until I hear the loud crack of the rope breaking his fall. He hangs with his hands in his pockets, gagging, kicking his feet. He gags, kicking his legs, spittle running away from his chin like a strand of wet dental floss. “To think of having made all the films of Lars Von Trier, as well as the legendary television series The Kingdom, at three days old … the mind boggles.” With this, Paul Broth coughs and goes silent. He hangs like an actual hung man, urine streaming down one pant leg and onto his shoe, and we turn away fearing that, perhaps this time, he has died in earnest. Every year, we remind ourselves, feels like the year when he’ll finally die for good, and we’ll never again have occasion to believe in the invincibility of our founder. Naturally, this freights his pronouncement with considerable gravity. Though there’s no consensus as to which newborn he anointed — assuming we are incapable of seeing all three as a single being — the fact that the Dodge City Lars Von Trier is among us now, crawling at our feet, is no small thing. The significance of having fleshed out that body of work, at so young an age, with so little self-awareness and next to no resources, makes us feel we are in the presence of a saint. A saint, though, with an awful burden on his shoulders, a lifetime of asking himself Where, after having created the life’s work of Lars Von Trier in three days, do I go in the years and decades to come? A saint who, perhaps, ought to have been martyred in his moment of greatest potency, already receding into the past as we crawl through the swamp away from the hanging tree. We look down at the newborns and think I wouldn’t wish that fate on any of them, while, at the same time, trying to decide which of the three to venerate, casting the other two into the same mediocrity we have cast ourselves into, never to emerge except vicariously through the one we vest with our yearning for the divine. AS WE CROSS THE SWAMP, three official stenographers hurry to take our places at the foot of the tree, where, for the time being, Paul Broth hangs silent and listless. We refrain from sharing his pronouncement with them, so as to keep the revelation private, if only for tonight. We make our way to the Welcome Center, where there’s a midnight breakfast on Tuesdays and Thursdays, all the pancakes served on paper plates printed with Paul Broth’s face, the syrup dispensed from pitchers in the shape of his head, and a life-size plastic hanging tree in the center of the concourse, its branches ever full of crawling children, their mothers stuffing down pancakes with one eye on them, ready to pounce the moment they crawl too close to the noose.